The euro slumped to a 14-month low against the US dollar, after the ECB reduced interest rates and announced its upcoming assets purchasing program aimed at fighting the looming deflation threat. The euro hit a fresh 14-month low against its US counterpart, and the EUR/CHF sank to almost a two-year low, on Thursday. That happened after the European Central Bank reduced interest rates and announced it was preparing an asset purchasing program, as a step to stave off deflation. The central bank cuts its main interest rate by 10 basis points, to 0.05 percent. On the press conference that followed, Mario Draghi said the ECB was planning to purchase securitized loans and covered bonds, starting from October. 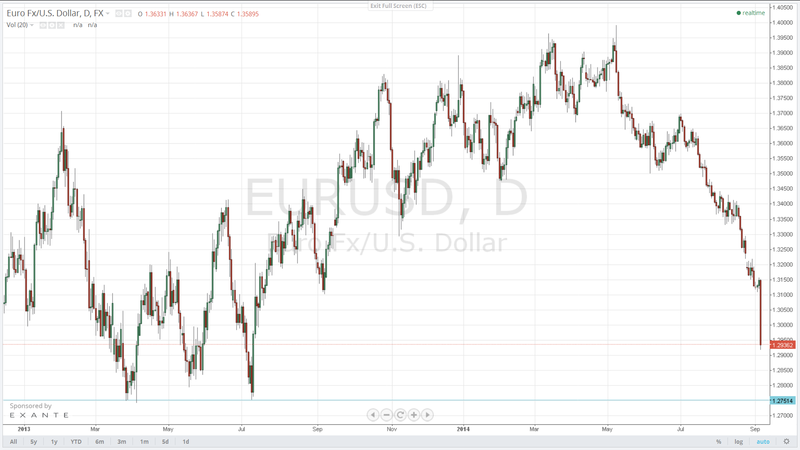 The EUR/USD slumped to 1.2919, breaking through its key 1.3000 resistance for the first time in 14 months. The EUR/CHF touched a low of 1.20450, the lowest since November 2012. Speculations were increasingly rife on the ECB’s possible launching of an asset purchasing program, especially after Draghi’s hint at the Jackson Hole meeting on August 22 that such a shift in policy was possible. The greenback soared broadly against a number of other currencies, despite the background of US jobs data which were weaker than expected. According to the Labor Department, there was an increase in initial claims for state unemployment benefits, by 4,000, to a seasonally adjusted 302,000 in the week ending August 30. That somewhat exceeded expectations, but the levels were consistent with the gripping labor market conditions. Analysts pointed out that if the Friday’s figure of US nonfarm payrolls was strong, expectations for the Fed’s first interest rate hike could be stepped up until the first quarter of 2015. According to analysts’ expectations, US employers have contributed a massive 225,000 jobs in August. In the event of a stronger-than-expected figure, the market would respond with optimism. This in turn would shift expectations for an earlier Fed rate hike. The last euro against the dollar figure was down 1.06 percent, at $1.3011. The dollar against the yen was up by 0.22 percent, at 105.02 yen, and the dollar against the Swiss franc was up 1.02 percent, at 0.9268 francs. The last figure of the US dollar index was up 0.65 percent, at 83.405. The last benchmark 10-year US Treasury notes price figure was down 7/32, at 2.44 percent, down from the late Wednesday yield of 2.41 percent.